Very special thanks to Screenwriter Rick Drew. 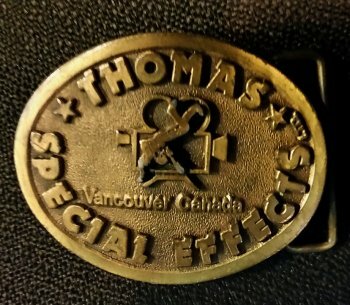 Last week, Rick dropped by just as we were closing for the day and gave us this vintage Thomas Special Effects belt buckle, which he had been proud to own for the past 35 years. Originally designed by John and Betty Thomas,, only a handful were made, and given to very special people, like Rick. Rick told us he thought the buckle belonged back at Thomas' with Betty and I. We had been searching for one of these old belt buckles for a few years without success. Thank you Rick. It means a lot to us and we were left speechless, and just a bit misty eyed.